Throwing money at the Pentagon, while cutting everywhere else, betrays the president’s promise to rebuild our country. President Trump’s “America First” budget is headlined by its big hike in military spending, which Trump touts as “one of the largest increases in national defense spending in American history.” The buildup is “paid for” by cuts in civilian programs, including savage cuts to the State Department, UN programs, foreign aid and the Environmental Protection Agency and anything related to climate change. In fulfilling his campaign pledge to throw money at the Pentagon, Trump is undermining his oft-promised America First foreign policy. Trump’s budget document misleadingly claims that the “military’s depletion under President Obama is our foremost challenge.” In fact, the United States already spends nearly 40 percent of all the money spent globally on defense and more than the next 12 highest military spenders combined. (The hawkish GOP Senator John McCain of Arizona complained that Trump’s budget calls for only a 3 percent increase over Barack Obama’s last budget.) 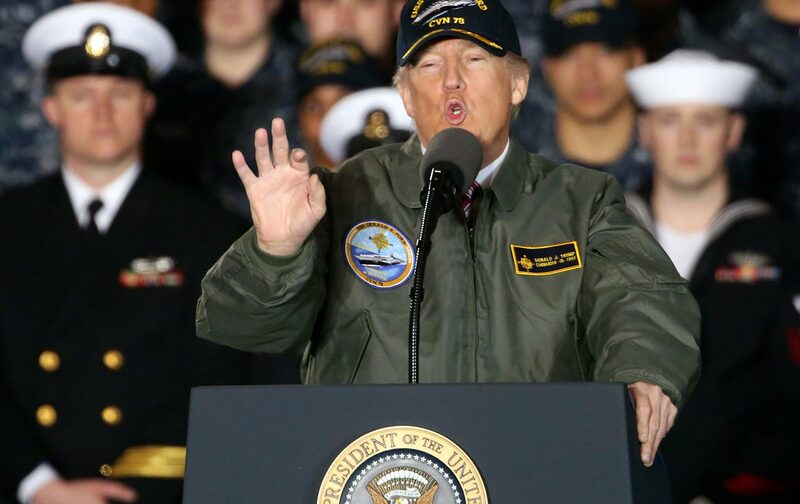 Yet on top of the billions already being poured into the military, Trump wants to add 60,000 active-duty soldiers to the Army, 78 ships and submarines to the Navy, 12,000 Marines, 1,200 active Air Force fighter planes, plus enhanced missile defense, cyber-capabilities and more. The president mistakes the problem. The military is stressed not because we spend too little but because it is asked to do too much. Trump’s budget is paying for a military that is tasked with policing the world—with a bigger Navy, more expeditionary forces, and more attack aircraft. This global reach is reflected in Trump’s early foreign-policy moves—continuing the buildup in Eastern Europe, sustaining the longest war in Afghanistan, apparent mission creep in Yemen and Syria, threatening military action against North Korea, and more.